IWC intumescent paint is an intumescent coating for walls and ceilings. Inherently non-combustible surfaces such as plasterboard and brick can become a potential fire hazard due to repeated redecoration with conventional paints. Different paint types from a variety of manufacturers have generally been used over many years with less than thorough preparation. In a fire thick layers of old paint tend to de-laminate rapidly catching and spreading fire around a building. In extreme cases a lethal “flash- over” fireball effect is created. The resultant risk to life and property can be greatly reduced at minimum cost using a combination of IWC intumescent paint, an insulating “intumescent” barrier coating and SFR wallcoat. The IWC intumescent paint system can help landlords comply the the Fire Safety Order 2005. Ask us for details. 1 coat Intumescent basecoat for walls and ceilings. For wallpaper & multi-layer painted surfaces. Class 0 + Bs1 d0 with 1 coat of SFR wallcoat (smoke & flame retardant). Intumescent basecoat for 30/60/90/120 minutes protection on plasterboard, cementitious board and concrete. Use with 1 coat of SFR wallcoat to seal. The Fire Safety Order 2005 requires property managers to comply with current fire standards for corridors, stairways, entrance lobbies etc.Multiple layers of incompatible paints “Multi-Layer” can create dangerous Class 4 or EN Class D + E Surface Spread of Flame risk. 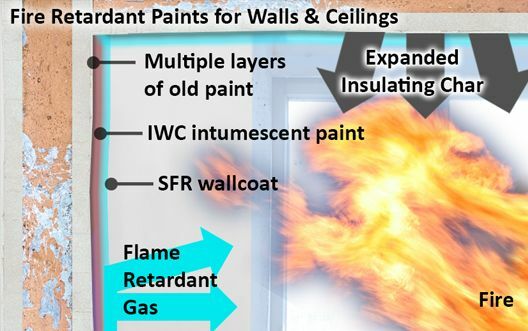 SFR wallcoat is a 1 coat smoke and flame retardant paint. Durable wash-resistant water based paint. Use Wallcoat SFR over Wallcoat for high-risk surfaces. High opacity 1 coat cover over Wallcoat. Class 0 + Class B s1 d0. 2 coats direct to bare or medium risk walls and ceilings. 25 and 100 square metre packs and 5 kg Packs.